Your Mac running slower than usual? It happens to the best of us — which is why everyone should know how to declutter and free up disk space on their Mac. Not only will this speed up your computer, it’s also a great opportunity to organize your files. Clearing disk space on a Mac can make your computer feel like new. Over time, most Macs, especially those that experience regular use, get full of documents, files, apps, images, videos, and other junk and clutter. Before you realize it, your once fast Mac could be wheezing and struggling through the day with a bloated disk drive and CPU that isn’t up to the task. We’ve compiled some quick tips on how you can free up disk space and get your Mac running at peak performance again. One crucial change you can make is to start monitoring your Mac’s disk usage and other vital statistics. There are a number of easy, intuitive apps that will give you a clear rundown of how well your machine is running. 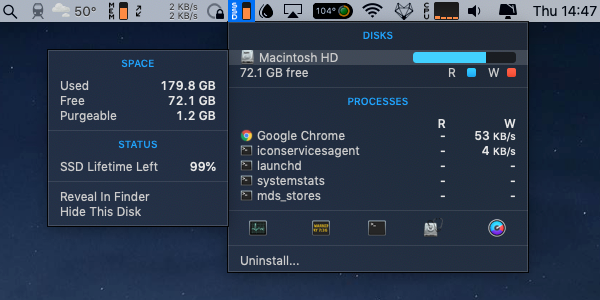 iStat Menus can provide you with real-time information about how much disk space used. Keeping your Mac running quickly and efficiently sometimes requires a little digging. Disk Drill offers both a safe way to backup your files and a robust set of tools to analyze your disk space. Not only can the app highlight files that put unnecessary strain on your storage, it can also detect damaged files and help restore them. The more information you have at your fingertips, the better! The first step to helping your Mac run faster is to clean up as much disk space as possible. Over its operating life, a computer collects a bunch of unnecessary data. To get back to peak performance, you’ll need to free up space on your hard drive. Manually removing old files and applications is a chore, and often doesn’t get to the root of the problem. 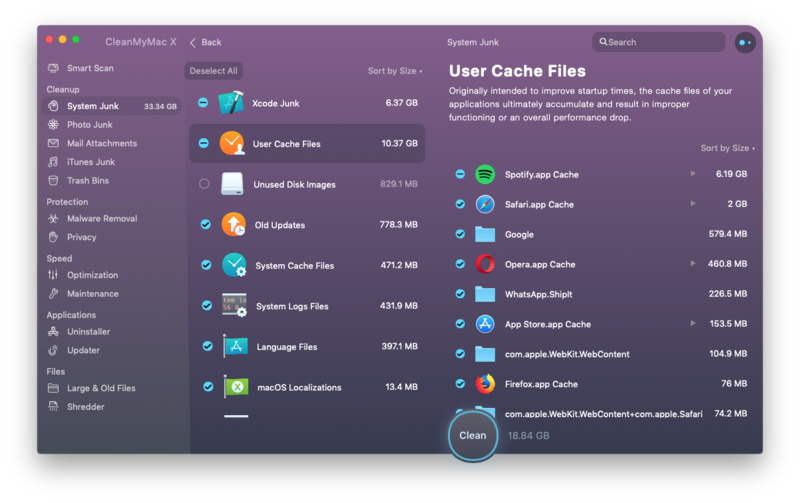 Your macOS, your apps, and your browser all use a shortcut called “caching” to run faster. But over time, those caches fill up with useless information that bogs down your computer. Why is it important to clear the cache? The short answer is that caches litter and bloat Macs. They aren't just a byproduct of browser history — most systems and apps, such as Pages, Numbers, Keynote, Mail and Photos, create huge amounts of temporary files that linger in the background. These caches of data are essentially just junk files, and they can be safely deleted to free up storage space. When it comes to cleaning a Mac, you have two options: delete files manually or get a cleaner app to help you. Clearing your cache files with CleanMyMac is the quickest, safest way we know. In the Applications folder, you probably have several if not dozens of apps you don't need. Removing them manually might seem as easy as putting them in the trash and emptying it. But, chances are, Applications aren't the only place an app is hiding within your Mac. We recommend checking a wide range of folders for remnants and support files. Be careful when removing app files manually though. You don't want to end up deleting an essential file and causing serious problems that would require a professional to fix. At least, write down all of the apps you’ve sent to trash, so you know what you are looking for when tracing support files and anything related. Or better yet, delete apps completely with CleanMyMac Uninstaller module. With many applications, especially photo and music managers, it can be easy to duplicate large files without realizing it. There’s no reason to give disc space to three copies of the same photo. 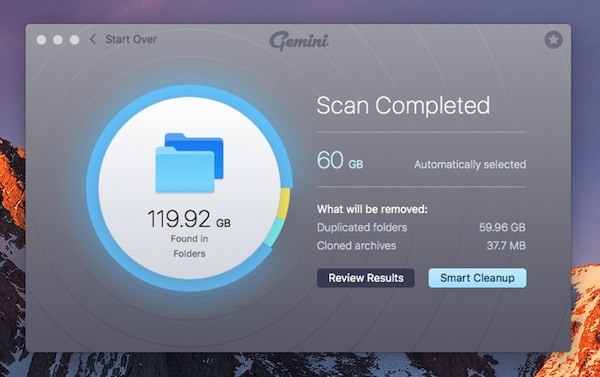 Gemini, an innovative cleanup app, is built to help you find and eliminate duplicate files on your hard drive. Even better, it can identify near-identical files as well, giving you an easy way to delete the slightly shaky versions of your vacation snaps in one convenient window. Most Mac users are surprised at just how many old, large, and unwanted files are cluttering up their disk drives. As soon as you don’t use a file, you forget it. Unfortunately, your Mac does not. CleanMyMac will source and identify files you don't need. All there is to do is click Remove or untick anything that you want to keep. 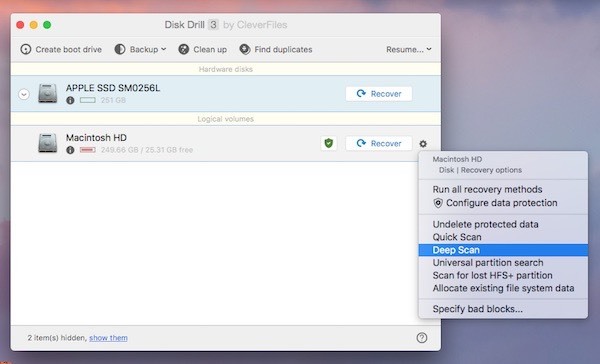 Another helpful app here is Disk Drill, which can recover the files you’ve lost — through smart disk analysis — or back them up in a safe, secure way, so that they aren't taking up space on your drive. Another source of system-slowing junk is email and text attachments. Even if you don’t download an attachment, your desktop mail client holds onto a version so that it can show you previews and access the file more easily. “But I deleted that email!” you say. Often that’s not enough—these downloads can hang around long after the original email is gone. It’s possible to clean them out manually, but the far faster and easier option is to use CleanMyMac. Something else that comes as a surprise to most Mac users is just how many backups your system carries at any given time. Copying and pasting, and the duplicate feature make it too easy to replicate your work in different folders. At the same time, you’ve probably got dozens of cached backups of files and documents that are invisible but taking up more space than you’d want. CleanMyMac will find old backups for you and remove them in a click. But also, switch your backup client to Get Backup Pro to backup only those units you want (for Mac). 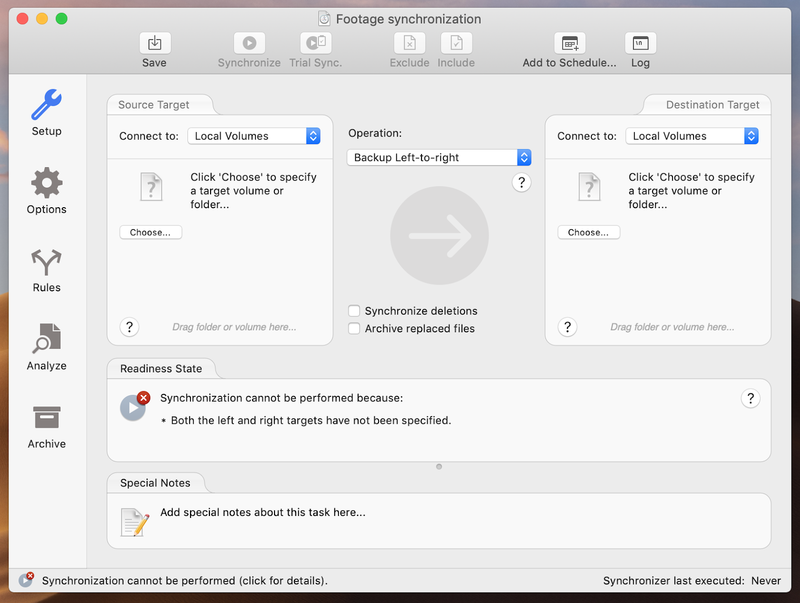 If you need to quickly transfer files or folders to another server, use a backup sync app ChronoSync Express. The Downloads folder is another area full of files you’ve used once and will never need again. 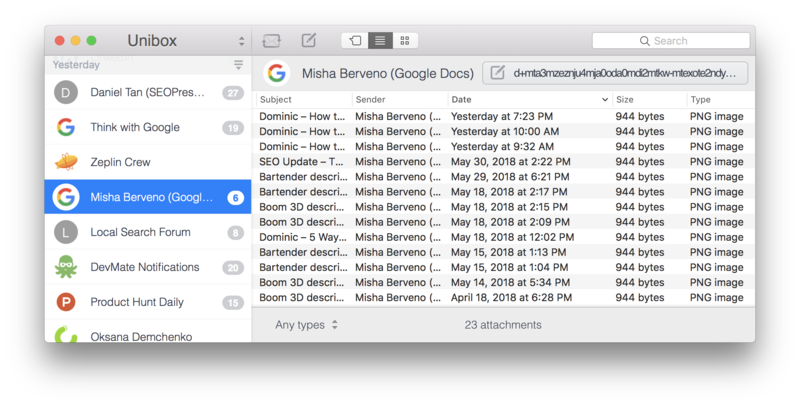 What’s more, your email client — whether cloud or desktop-based or both — is keeping all of your attachments since you opened the account. Almost everything you download and don't move out of those folders is a duplicate. Or if you never ended up moving the folder or copying it — as is often needed when you download a Microsoft file and convert it into a Mac document, such as Pages or Numbers — then you’ll have forgotten about it after a few weeks. All these old downloads do is gather dust. Taking up space you probably need for files, documents, apps, and images. Some downloads are hidden, taking up even more space. And the further back you go the more useless these documents are. Do you really need to keep a text file labelled “Christmas shopping list 2015” or “Dream holiday Summer 2016?” Probably not. Free up some much-needed space on your Mac and delete as many of these old download files as possible, and remember to come back and tidy it up every few months. CleanMyMac can help for sure. But also, consider switching your email client to Unibox, which automatically reduces excessive downloads. AppleInsider described Unibox as “the best client we tried,” and Macworld said it is “A welcome, fresh new approach to email on the Mac.” Unibox groups emails by sender and includes an attachment list, so you can quickly find what you need, then delete those documents out of the Downloads folder. Most of us don’t need dozens of languages. So unless you work in the translation industry, be sure to remove language support files from your apps and free up space for something else. CleanMyMac can check for and remove language support files from any app. Something else you might not know is how much space iTunes devours. Not only does iTunes store old songs and videos you probably don’t want anymore, but it also makes backups every time you connect an iPod or iPhone to your Mac. So you might be short of space because iTunes replicates what used to be on other devices at specific moments in time. 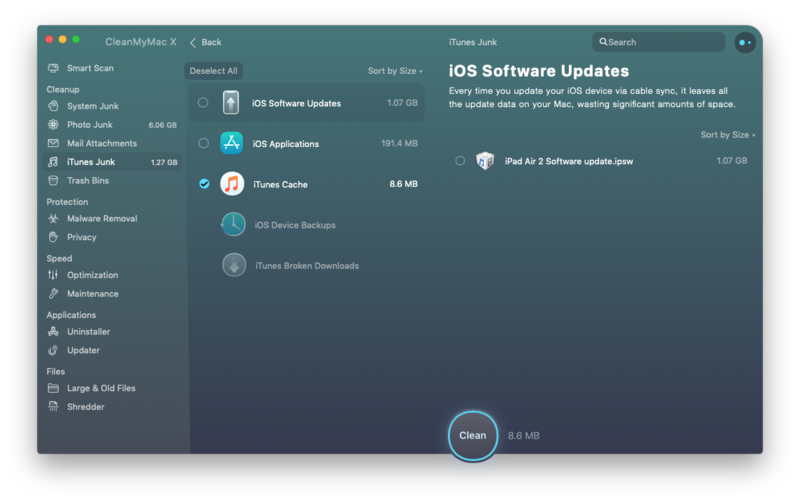 Since old songs, album art, and iPod backups aren't really that helpful when they are slowing down your Mac, you’d want to clear them out. Again, this is something you can do manually — which might take a while — or CleanMyMac can do it for you. Finally, something manual you can do with minimum extra effort — giving your Mac a break. Clicking Shut Down or Restart is a great way to reduce the strain on processors, software, apps, and hard drives. Just like yourself, a Mac runs faster after a short break and sleep, especially when the disk drive isn’t full of files you don't need. Of course, cleaning utilities can help you get rid of useless files when you need it to, whereas Unibox can save you from a bulging mail attachments folder. The last piece of advice from us is to get a monitor app like iStat Menus, so you can watch the health of your Mac daily and effortlessly. They say a messy desk is the sign of a troubled mind. This may be true for desktops as well. You can free up all the disk space in the world, but it won’t matter much if you can’t make sense of your files. Fortunately, you have several options that can give the order to both your desktop and your file system. Apps like Declutter can help you consolidate and organize your files in a sensible, straightforward way. Like Finder, it allows you to make color-coded folders. Unlike finder, it lets you set up rules for filing so that files of certain types automatically end up in the right place. Once you configure your Decluttered desktop, it’s easy to keep it that way. Organizing your desktop is half the battle, but you’ll also want to make sure your underlying file management makes sense. You can customize your Mac’s Finder as much as you like, but there are also more tailored options. AnyTrans is a small file transferring app that helps bring all of your data into order, no matter where it’s stored – Apple device, Android, or cloud drive. By eliminating both hard disk and desktop clutter, you’ll improve your Mac’s performance as well as your own workflow. Plus, Setapp’s decluttering, disk cleanup, and analysis apps help you complete what would be a tedious chore in just a few clicks. There’s no telling how much time and effort you’ll save by giving yourself (and your Mac) a break.